Charles Aaron's Photo Album- Good photos, scratch built PA-18, Spraker fuselage. He's flying! Taliaferro Super Cub- The ultimate Super Cub restoration project. Cubus Maximus Photo Album- Over 1000 photos of entire Smith Kit PA-18 project. Now flying. Marty Feehan's Project - Building Wag Aero 2+2. Wood ailerons and flaps. Great photos. See drawings below. Rick Davis "Davis Special" - Awesome "Producer" style aircraft with D&E Riblet wing. Finished and flying! Erik Newton's Bearhawk Site - Awesome construction log of a Bearhawk. Colin Potter's STOL King Project - Very cool Fiesler Storch style airplane. Excellent construction photos. Smith Aviation Super Cub Builder photos - These are the photos that were on the Smith Aviation site before sold to Back Country Cubs. SuperCub.org - if you haven't been here, you are really missing out. Tons of helpful people and information. Lots of photos. The Cub Club - blueprints, drawings, technical info. Requires membership. Aircraft Spruce - everything under the sun for homebuilt aircraft. 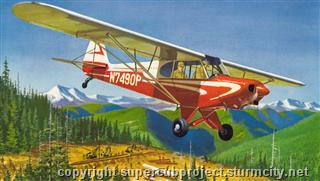 Northland Aircraft - order all the PA-18 Super Cub drawings on a CD-ROM. I have this CD and it is the backbone of my project. D & E Aircraft - experimental Cub wings, wing parts, struts. My wing kit. www.supercub.com Back Country Cubs, kits and Cub parts. I ordered my cowl kit from them. Univair - expensive certified parts. I bought struts and some fuselage parts there. Dakota Cub - more expensive certified parts. Some great online technical drawings as well. Wag Aero - Cub parts, aircraft hardware. Where I bought my tail kit. Wicks Aircraft - another great source for aircraft hardware. Very reasonable shipping. EAA Chapter 79 - My local EAA chapter in Spokane, WA. Tube Cutting Calculator - Very nifty online tube cutting application. Miter and fishmouth your tubes perfectly! AC 41.13-1B - FAA's Acceptable Methods, Techiques, and Practices for aircraft building and repair. Warning - use information on this web site at your own risk! I am not an expert!